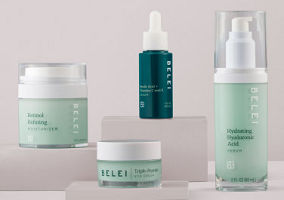 E-commerce giant Amazon is expanding its burgeoning private label range with the launch of a new dedicated line of skincare products under the name Belei. Claimed to offer solutions for different skin types and to feature ingredients with proven effectiveness, the new 12-strong line of products includes moisturisers, serums, eye cream and spot treatments. They are advertised as being free from parabens, phthalates, sulfates and fragrance, and are designed to address “common skincare concerns” like acne, the appearance of fine lines and wrinkles, dark spots, dehydration and dullness. “Our goal is to help customers spend less time and money searching for the right skincare solutions”, said Kara Trousdale, head of beauty for private brands at Amazon.com. “We took a simple, no-nonsense approach when creating Belei, developing products with ingredients that are both proven to deliver results and also offer customers great value for the quality”. Products are priced between $9 for face wipes and $40 for a hydrating hyaluronic acid serum. Amazon has been expanding its own brand range since 2016, when it first planned the launch of a private label lineup of food and drink products. It has also since expanded into own brand petcare with the launch of the pet food brand Wag.